Slovenia is one of the greatest masterpieces on earth. It will awe you with its jaw-dropping beauty and enchant you with its European pizzazz and quaint charm. Slovenia is a historical crossroads country with over 2 million residents. 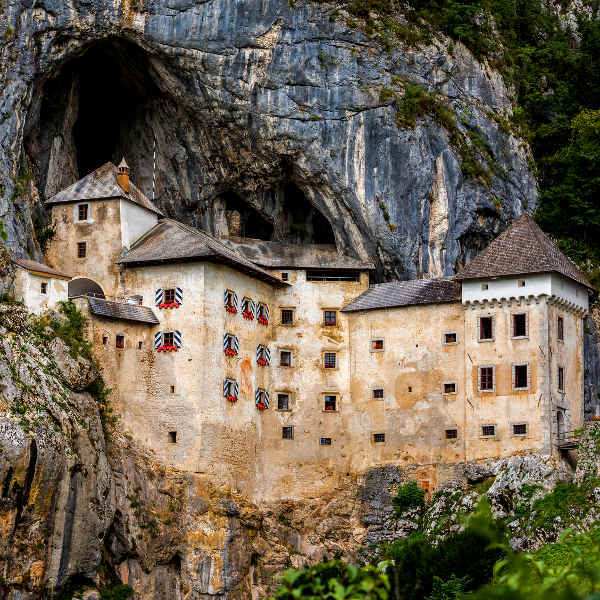 Attractions include Lake Bled in the Julian Alps, Predjama Castle in Postojna, and the Kozjak Waterfalls in Kobarid. Get ready to witness paradise on earth with cheap flights to Slovenia. Ljubljana Jože Pučnik Airport (LJU), which is a 20-minute drive from the capital of Ljubljana, is the hub airport of Slovenia. 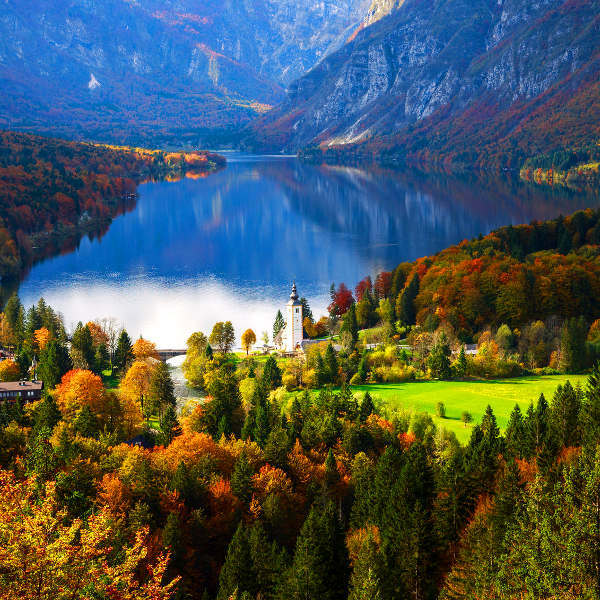 With its dreamy tapestry of soaring alpine mountains, mesmerising valleys, shimmering emerald lakes, turquoise rivers, Mediterranean coastline, and wild forests that cover half the country, Slovenia is paradise on earth. Beneath the picturesque landscapes of Slovenia lies a magnificent labyrinth of caves, tunnels and underground waterfalls. The most famous of these are Postojna Cave, Pekel Jama and the Škocjanske Caves. 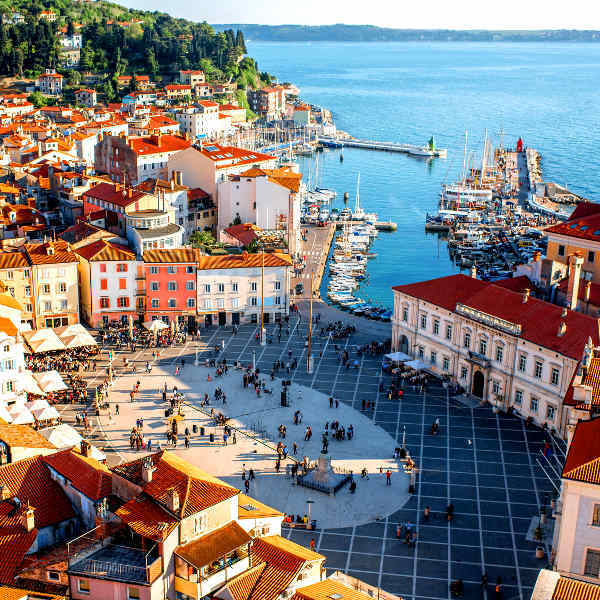 Witness Venetian decadence in Koper, wander through winding alleyways and Gothic architecture in Piran, lose yourself in the historical panache of Ljubljana, or try wine from the oldest vine in the world in Maribor. Slovenia experiences a typical continental climate, with cold winters and warm summers. The coastal areas and lowlands are gifted with a Mediterranean climate. The best time to visit Slovenia depends on what you want to do. For snowy landscapes and excellent skiing in the Julian Alps, the best time to visit is between December and March. For beautiful landscapes that are ripe for hiking and adventure sports, the best time to visit is between April and September. The shoulder seasons of April to May and September to October are a great time to visit if you want to avoid the crowds and high rates. Notable events include Ljubljana Festival, Shrovetide Carnival and Lent Festival. For cheap flights to Slovenia, the best time to visit is from October to December (with the exception of the festive season). Slovenia is a country of idyllic landscapes and quaint cities. Stretching from the Adriatic Sea to the Julian Alps and with over half of the country draped in fairytale landscapes, there is no escaping the sheer beauty of this country. A trip to the Upper Carniola region (or Gorenjska) will leave you breathless. Triglav National Park is the only national park in Slovenia and it is sublime. Snow-dusted mountains, enchanted Alpine meadows and shimmering turquoise lakes stretch for miles. The iconic Lake Bohinj and dreamy Soča River can be found within the park, while Lake Bled nestles on the outskirts. Slovenia is also home to a magical subterranean world of caves and waterfalls. Locals insist that Vilenica was once inhabited by fairies and Socerb Jama provided a haven for St. Socerb. Along with majestic landscapes, Slovenia is also home to a number of old cities. Be sure to visit the coastal cities of Piran and Koper, go wine-tasting in Maribor, and explore the capital, Ljubljana. Slovenia is a place where hearts are awakened and fairytales do come true. Compare several airlines and book your cheap flights to Slovenia online at Travelstart! Slovenia is a safe country. However, it is still recommended that you use common sense and maintain vigilance as you would in any other unfamiliar country. Visitors to Slovenia must register with the police within three days of arriving. Travel insurance to cover theft and medical expenses is recommended. Carrying large sums of cash and valuables should be avoided, as petty crime such as pick-pocketing and bag snatching does happen in crowded areas. You should familiarise yourself with the local laws and rules of the road before arriving. Proof of yellow fever vaccination is required if you are arriving from an infected area. Insect-borne diseases are a risk in certain parts of Southern Europe, so precautions should be taken to avoid bites and infection. Immunisation against hepatitis A & B and rabies is recommended. Routine vaccinations include MMR, diphtheria-tetanus-pertussis, varicella, polio and influenza.